There are creations only you can bring into the world. There is a purpose for your life–one that nobody else can fulfill. How do you find that purpose? Joy. Follow your joy. Give birth to your brilliance. Joy is our built-in compass. It tells us what matters to us and what feeds us. Joy tells us we are on the right path–our path. Joy tells us when we are fully alive. Joy tells us when we are operating to our full potential. When you do work you love, you’ll be the most productive and creative you’ll ever be. Stop making compromises. Create a life you love. Decide that you will not settle for anything less than what you truly want from life. 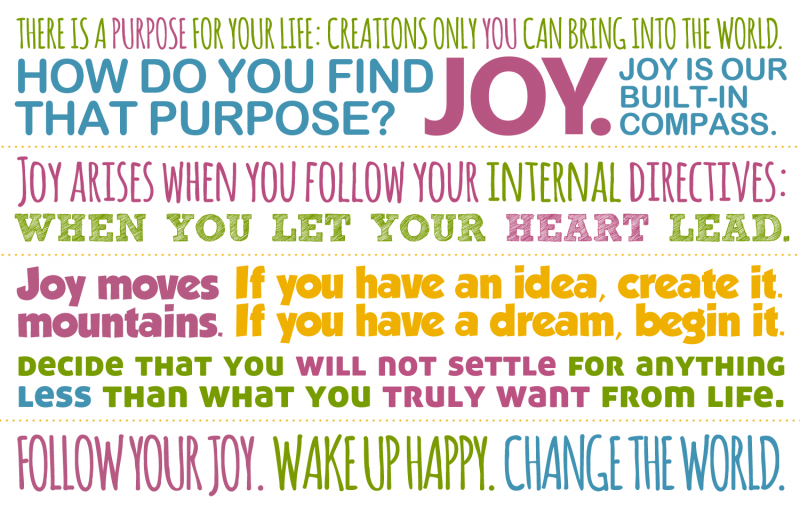 Joy is what happens when you start following your internal directives. When you listen to your heart, and follow where it leads, joy is the natural result. Stop meeting some needs at the cost of other needs. Go for what you really want. Create a life you truly enjoy. If you aren’t 100% happy about the life you are living, then do something about it. If you want to do something that matters to you, begin it. If you want a thriving community of people you jive with, start building it. If you want a lifestyle that feeds your soul, start creating it. Start living for your own joy. And never look back.